On 2-3 November 2017, the Digital Life Research Program at ICS convened a workshop (opens in a new window), in collaboration with ACIAC, on automation and the future of publishing and knowledge. The two-day workshop was engaging and interactive, attended by researchers and students from WSU, Curtin, the University of Wollongong and the University of Canberra. It brought academic attention to the question and politics of knowledge production and its infrastructures, with a particular focus on publishing. The workshop started with an opening theoretical panel on ‘Automating Knowledge and Invasive Apparatuses’, followed by one panel on ‘Open Knowledge and Publishing’ that focused on industrial innovations of publishing, and another on ‘Implementing New Knowledge Environments’ by WSU’s digital humanities research team, and concluded with ‘Knowledge Production and Autonomous Infrastructures’ presented by Fibreculture Publishing. 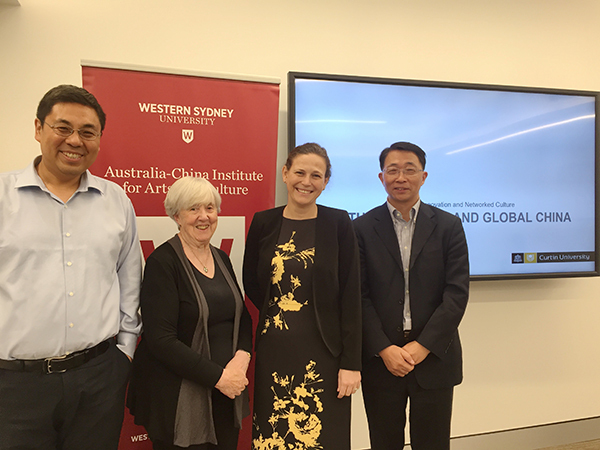 ACIAC research fellow Dr Xiang Ren, Associate Professor Lucy Montgomery, the Director of the Centre for Culture and Technology at Curtin University, and Professor Ivor Indyk from the Centre for Writing and Society at WSU formed the panel on open knowledge and publishing. This panel looked at the evolving role of publishing in opening up the access to and creation of knowledge in various contexts. Through the examination of Chinese digital publishing platforms, open access academic books, and literature publishing and translation, they interrogated the dynamics of publishing in removing the socio-economic and intercultural barriers against the growth and exchange of knowledge, as well as the political economy of publishing innovations. On 31 October, prior to the workshop, Associate Professor Lucy Montgomery from Curtin University, delivered a well-received research seminar at ACIAC, in which she introduced an innovative theoretical model to understand China’s digital innovation in global contexts and shared their interesting fieldwork on creative start-ups in Shanghai.